My grandmother lost her eyesight early in life due to a combination of Macular Degeneration and Glaucoma. My mom has had Glaucoma for several years, and was just diagnosed with Macular Degeneration. So I’m on a mission to do whatever I can to prevent the same thing from happening to me. I did some research and found that other than not smoking, diet is one of the best ways to help prevent MD. I have a pretty good diet. I eat a lot of vegetables and greens, but the really healthy DARK leafy greens that have been recommended to prevent Macular Degeneration, like Kale, have been harder to fit in my diet. I don’t really like the bitter taste of raw Kale. But a couple of weeks ago, we ordered a flatbread at Table 3 restaurant. It was topped with “Kale Chips”, which were to DIE for, but of course, they were fried. I’m a southern girl, so I love fried vegetables, but I wanted to try to replicate them without all the fat. 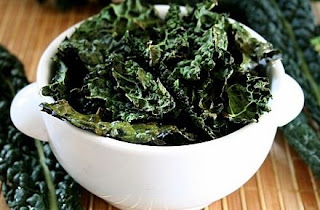 I found a recipe for baked Kale chips, which involved tossing them with a couple of tablespoons of olive oil. The problem with that method was that I ended up with half of the leaves covered with oil and the other half had little or no oil on it. I tried putting it in a ziploc bag and shaking it up, but it still didn’t come out even. So I pulled out my trusty can of PAM Olive oil spray. Voila! It was so easy to put a light coating on all the pieces on a baking sheet, then sprinkle with a little kosher salt and bake slowly for about 20 minutes or so. The only caveat is that, depending on your oven, you really have to watch them the last couple of minutes. If you cook them too long, they get a little bit burned, so the taste isn’t quite as good. If you don’t cook them long enough, they’re still limp, and not crispy. This is how I did it. First, after rinsing the kale and COMPLETELY DRYING IT (I rinse and then lay out on layers of paper towels while I cook dinner), I take each piece of kale and fold it over so that I can easily cut off the stem. I preheat the oven to 300 degrees, then tear the pieces into approximately equal size and lay out on a large baking sheet pan that I prepare by spraying with Olive Oil. I spray the tops of the leaves lightly but evenly with Olive Oil, then sprinkle with Kosher Salt. You could use any kind of seasoning you like. The leaves will shrink, so be careful with the amount of salt, but in my opinion, the salty crunchiness makes it really good! For the first pan of chips, I set the timer for 18 minutes. Then I taste a chip to see if it’s crunchy. Finished chips…this batch needed a lot of taste testing before they were done! Usually I need to let them cook at least two more minutes, but I have learned that I need to watch very carefully during this time. Once they start to get crunchy they can very quickly burn. Some days they cook faster than others. I don’t know what that’s about…maybe some days I don’t get them as dry as I should. If, after 20-22 minutes they are still not crunchy, I turn off the oven and let me stay for a little while. But they can still burn so I have to continue to check on them. After you make these a few times it becomes much easier…I usually cook them while I’m chopping other things, or piddling around in the kitchen, so it goes very quickly. I leave them uncovered in a bowl or platter for several days so I can grab a handful throughout the day. Don’t wrap them or put them in plastic, or they’ll lose their crunch.